Simpson Bay, St. Maarten (Wednesday September 5, 2018) – The Mold Remediation and Surface Removal Decontamination process is underway at the terminal building of the Princess Juliana International Airport - SXM. The scope of the work will also include the installation of HEPA air filtration units and portable humidifiers to dry any remaining wet building materials. The Texas-based company, BMS CAT International, was awarded the contract to carry out the mold remediation work, as the terminal building sustained severe damages following the 2017 hurricanes. During this process, the company will clean all the mold contaminated items on the ground floor of the airport. The Terminal Reconstruction project includes, “Package One,” the first phase of which is the remediation method. 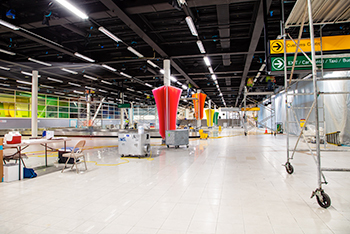 It also encompasses the cleaning of filters, light fixtures and any item that has remained in the terminal building after the internal demolition. The Mold Remediation and Surface Removal Decontamination project has also contributed towards the employment of over 50 local workers. The Managing Board has declared that the project is on schedule. It is the intention to have a seamless transfer of the Departure and Arrival Operations to the ground floor of the Terminal Building in November 2018. The SXM Airport will offer Wi-Fi services and be fully airconditioned. 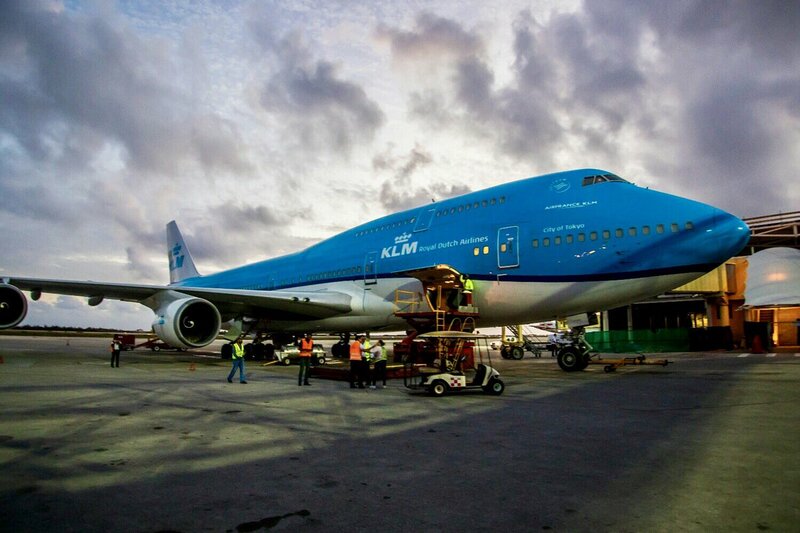 The completion of “Package One,” is much anticipated as the peak season for passenger traffic at SXM Airport is from December 15 to April 15 (Winter Season). Despite normal seasonality, the numbers of SXM departing passengers are increasing as St. Maarten/St. Martin tourism recovers from the hurricanes of 2017. For instance, in June 2016 SXM departing passengers were 62% of what they were in March 2016, but in 2018, the June average daily passenger volume was 106% of March 2018. This change reflects the ongoing restoration of hotel & time share rooms and the influence it has on SXM passenger volumes. In June 2018 there were 26 commercial airlines serving SXM with 22 catering to passengers and 4 for the carriage of cargo. And eventually taking out the webcam. Going to St Maarten later this year just my luck or as Victor Meldrew would say I don't believe it. I'm having enough trouble convincing the wife Maho Beach is the place to go as it is, life's a bit of a b****r sometimes. Oh well keep right on. Sadly it looks like St Maarten airport has been practically destroyed by hurricane Irma . apologies for any offense caused and I hope that the island recovers quickly and also hope the rest of the islands fare better. Just seen the horrendous scenes of destruction Irma has caused in the region. Truly shocking. What is certain is the islands will recover but they will need visitors and tourists to return as quickly as possible as that is the main industry in the region. I've just been looking at the airports website which uses a strap-line of "The EXPERIENCE will move you." Clearly they weren't to know. Winds gusting to 160 Knots, over 180mph. Just watching some horrendous footage on Sky News, it must be awful to be in it's path just waiting for it to arrive. The link below has some images of the damage across the island. My parents visited the island a few years ago. They said they walked around the airport and watched the aircraft coming and going. It's hard to imagine how the islanders will recover from this starting from scratch. I've actually visited a couple of times although only on cruise ships so only get a snap shot, however the Island is more wealthy than most and should be better placeed to recover especially given its Dutch /French background and come to think of it surely some of our rather large foreign aid budget could be used along with helping the other islands in this time of need. The terminal damage is mostly water damage apart from the air bridges which appear to be destroyed. I would hazard a guess the airport will be one of the first parts of the island infrastructure to be up and running again, all be it in a scaled back way. The airport is reported as open for "military purposes only" with aid flights to follow in a few days maybe as early as today. Obviously a return to anything like normal operations is a long way off. Badly damaged yes, destroyed fortunately no. Princess Juliana Airport will reopen to commercial flights on 6th October for airlines that want to resume flying there. The terminal building will not be open as it received $100 million worth of damage during IRMA and the roof still hasn't been repaired. Date for reopening Princess Juliana Airport to scheduled commercial flights has now been put back to October 10th. Photo caption: L-to-R Guillermo Lares – Signature Flight Support Area Director for the Caribbean and Latin America, Michel Hyman – COO/Acting CEO PJIAE N.V., Mellissa Arrindell-Doncher – Minister TEATT, Michel Hodge – Member Supervisory Board of Directors PJIAE N.V., Steve Kong – Managing Director TLC Execujet. Simpson Bay, St. Maarten (Sunday, November 12, 2017) - Minister of Tourism, Economic Affairs, Traffic and Telecommunication (TEATT) Mellissa Arrindell-Doncher did the honors on Friday with regards to the ground-breaking ceremony for the construction of the new Fixed Based Operator (FBO) facility at the Princess Juliana International Airport (SXM). According to Hyman, “It is now going on to 30 years since the first call was made for an FBO facility at this airport. In fact, the growth of the General Aviation sector in pre-Irma St. Maarten has been such that we were ranked second only to The Bahamas in this region where it concerns accommodating luxury jets. “Around this time of the year, we had all grown accustomed to seeing many of these private jets parked at our airport. As a matter of fact, in 2013 and 2014 we had to turn away about 70 and 60 requests respectively for such private jets to use our airport. Those aircrafts had to go to other airports, and once they find a new welcoming home, it usually becomes even more difficult to attract them to return to SXM. Modernizing our FBO facility, therefore, will certainly offer a good incentive for them to come back,” he said. Also attending the ceremony were representatives of the Supervisory Board of Directors of PJIAE N.V., the St. Maarten Tourist Bureau, Arrindell Aviation by Signature, TLC Execujet, Studio Acht and of Taliesen Construction. Glad to see they are repairing the infrastructure, I am still hoping to visit there at sometime in the near future. The Princess Juliana International Airport (SXM) Beach Cafe webcam is back up and running but this time they are asking for a donation to use the service. We are finally able to bring you live sound and video from St. Maarten and Princess Juliana International Airport (SXM). After a herculean effort by PTZtv, we have a new camera in place on a newly rebuilt mount held fast by over 1,000lbs of concrete. Check out our Facebook page for pictures and video from this recovery visit to St. Maarten and the Maho Beach area. Although we have done enough to bring you live streaming once more, there are still some issues that need to be resolved and don't be surprised if there are periodic outages in the days/weeks ahead. For example... our uninterruptible(sic) power supply (UPS) took a salt water bath and didn't like it. Will need to be replaced on a future visit. Very special thanks to JetBlue Airways for kindly offering to help sponsor the return of Maho Beach Cam. They flew us down to SXM from JFK. Please keep them in mind when booking your next flight to SXM or beyond. Also a big THANK YOU to all the fans who have contributed so generously to our recovery fund. That effort really helped get us back online much sooner. To watch our live video, click the 'X' in the top right-hand corner to dismiss this message. Note that it is not too late to help by contributing to our recovery fund. Choose a currency and pay what you like, when you like, if you like ... but no obligation to contribute anything! Click a ticket below and enter an amount that's comfortable for your budget. Thank you for supporting Maho Beach Cam and watching PTZtv! 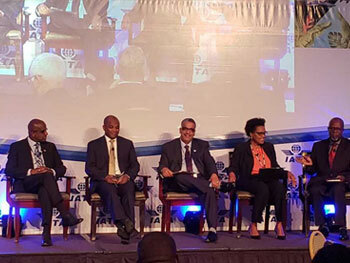 Chief Financial Officer (CFO) and Acting Chief Executive Officer (CEO), Ravi Daryanani of the Princess Juliana International Airport – SXM – was among panelists at the recently concluded Caribbean Aviation Day hosted by the International Air Transportation Association (IATA), the Caribbean Development Bank and ALTA, at the Hilton Barbados Resort. The “Executive CEO Chat” addressed the theme:“Challenges facing the Caribbean Aviation Growth an Intra-Connectivity.” The other panelists included the CEO of LIAT, Julie Reifer -Jones, Managing Director of Bahamas-air, Tracy Cooper, Secretary General of the Caribbean Tourism Organization, Hugh Riley and Media Consultant of Rogers Media House, Julian Rogers. The chat is a traditional flagship panel at IATA Aviation Days, bringing senior executives of the aviation industry together to discuss some of the challenges that the industry has faced over the past year and is likely to face in coming years. The overall goal of the panel was to get the panelists to shed light on how they have met or plan to meet those challenges. Reportedly, the air transport industry in Latin America and the Caribbean generates US$ 167 billion in GDP and supports 5.2 million jobs. The report, according toIATA, goes on to state that every year, 2.6 million flights operate in Latin America and the Caribbean, connecting 385 cities in the region and 160 cities around the world. Daryanani took the opportunity to update the panelists and delegates on the current operations at the Princess Juliana International Airport following the 2017 hurricanes. “Maybe Hurricane Irma did one thing for us, it allowed us to hit a reset button on how to reach out to our airlines, VIP services, partners and neighbors on the French side,” he said. He further revealed that a Memorandum of Understanding has been signed between the authorities of Dutch and French St. Martin, forging a bond for both sides to work together in efforts to market the island as one destination. Two Ukrainian acrobats have come under fire for performing a stunt beneath a low-flying aircraft on a beach on the Caribbean island of St Maarten known for its dangerous jet blasts. Oleg Kolisnichenko shared a photo on Instagram of his partner Yulia Nos doing a one-handed handstand on his head on Maho Beach as a cargo plane passed overhead. It looks like her feet were just metres from the plane's wheels as it came into land at neighbouring Princess Juliana International Airport. It seems a pretty crazy thing to do to be honest. I know they're further away than what it looks but still, it doesn't look like a wise thing to do.